Why Is My Stomach Flat Until I Sit Down? When you're standing up, your stomach looks flat and toned, but when you sit down or bend over, the rolls of fat appear. This happens to almost everyone, and there's a very simple explanation. When you're standing up, your body is stretched out and your abdominal fat is extended over a larger area. When you sit down, your abdominal area compresses, bringing all the abdominal fat together, making it seem copious. Only people with very low body fat don't experience this. Some people tend to put on weight in their abdominal region. This happens often as people get older. It doesn't take much abdominal fat to create a roll when you sit down. The more abdominal fat, the bigger your roll will be. If your stomach is flat when you're standing and the roll only appears when you're seated, you shouldn't worry too much. It's when your belly starts to protrude while standing that you should be concerned, because excess abdominal fat can cause health problems. There are two types of belly fat: subcutaneous and visceral. Subcutaneous fat lies just beneath the skin and doesn't pose a problem. It's the type of fat you can pinch -- like the type that forms the small rolls when you sit down. Visceral fat lies deep within your abdominal cavity, and it is the more dangerous type. You don't need to determine whether you have the right amount of body fat from looks alone. Have your doctor or another health professional measure your body fat and assess where you stand. According to the American Council on Exercise, the average body fat percentage for women is 25 percent to 31 percent. For men, the average range is 18 percent to 24 percent. If you're fit, you might have less fat, in the range of 21 to 24 percent for women and 14 to 17 percent for men. Athletes will have even less body fat, and they are the types who may not see that roll of belly fat when they sit down. But they put in a lot of hours training, unlike the normal person. In some cases, people can have too little body fat. Any less than 14 percent body fat for women and 8 percent for men is too low and can lead to serious health consequences. 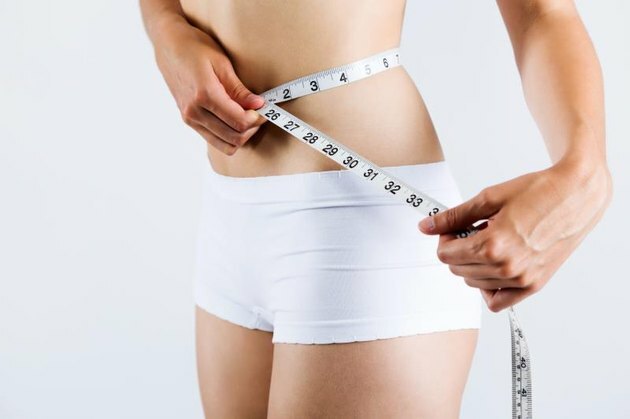 If you feel like you have more body fat than you want, and your doctor has given you the green light, a regular exercise program that includes cardio and strength training can help you lose fat and build muscle. Aim for at least 150 minutes of moderate-intensity cardio, or 75 minutes of high-intensity cardio, each week. Engage in full-body strength training exercises two or three days a week to target all your major muscle groups, including your arms, legs, chest, back, shoulders and abs. Your diet will make a big difference, too. Cut out processed foods and added sugars, both of which are major culprits in fat gain. Stick to whole foods such as fresh fruits and vegetables, whole grains, lean meats and poultry and fish. Keeping your calorie intake slightly lower than what you burn each day will help you shed abdominal fat.